Chance the Rapper is a married man. The Coloring Book MC wed his long-term girlfriend and mother of his daughter, Kirsten Corley, over the weekend. 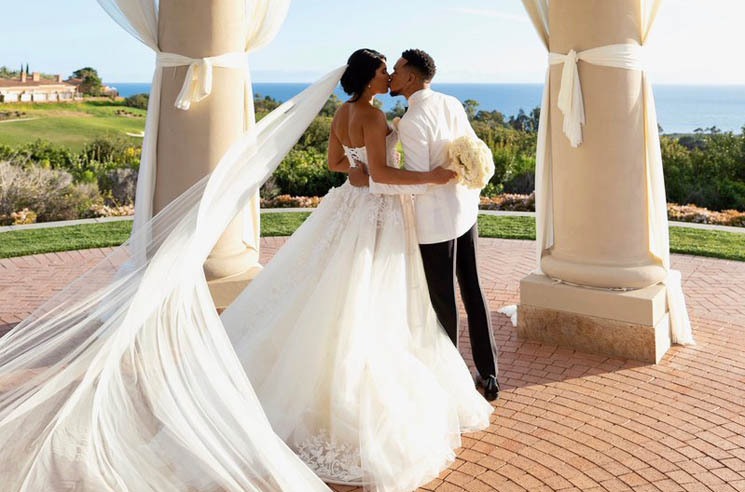 The couple got hitched at the Pelican Hill resort in Newport Beach, CA, on Saturday (March 9). According to E! News, the venue was decked out with white roses, and a string quartet was on hand. Amongst the 150 guests were famous pals Kanye West, Kim Kardashian West and Dave Chappelle. Chance and Corley have legally been married since December, when they had a civil ceremony at the Cook County clerk's office in Chicago — but is it really official until Kimye is there to celebrate? Chance and Corley go way back, meeting for the first time when the rapper was just 9 years old. They welcomed their daughter, Kinsli, in 2015, and got engaged last year on the Fourth of July. Last week, Chance shared a touching tribute to the day he first met his wife. Revisit the Twitter thread below. He's since shared some shots from the weekend wedding. Check those out below. Chance's brother Taylor Bennett also shared some shots of his big brother's big day. See those below.